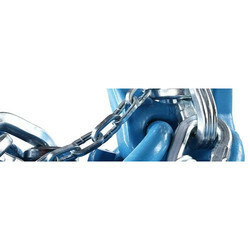 Uniquely positioned amongst the incredible business names of the industry, we are highly betrothed in providing a supreme quality array of Snow Chain within the fixed time frame. Pewag offers the right product for every situation. Filter Max Impex Pvt. Ltd.
C. S. Koreinfra Engineering Pvt. Ltd.
- Forged steel, heavy duty chain. - Ideal for snowy, icy and muddy terrain. - It is composed from manganese alloy, special cross “V bar. - Wear and resistance, hardened steel. - Mesh design provides smooth traction in snow and ice. - Mesh design manganese alloy, special square material. - Wear and tear resistance, hardened steel. - Tension assembly is made of chain. Efe model is the strongest forestry chains ever, to give best traction the heaviest conditions of nature. - Special design cementation forged steel. - Ring, 14-16 mm cementation steel. - Heat treatment: 52-55 HRC surface hardness, 0.4-0.6 mm hardness depth, 34-36 HRC core hardness. 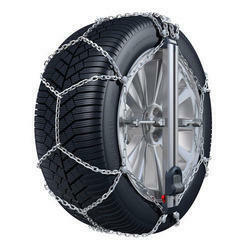 Leading Manufacturers of Snow Chains and Non skid Chains in India. We manufacture all tyres , Tyre Chain . Product can also be developed as per requirement. pewag snow chains cannot only be used in wintery conditions. Our products can be used on all different types of grounds – mud, pebble and sand: In impassable terrain military and ambulance drivers rely on pewag quality. FERRETERRO Started Manufacturing of Snow Chains and Non skid Chains in India, specially for Extreme terrain. HVK System & Marketing Pvt. Ltd.